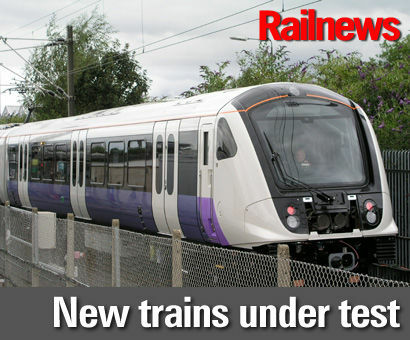 THE first Class 345 trains for the Elizabeth line are now under test at Bombardier in Derby, and will enter London service in May. Transport for London confirmed the launch date as trains for the new route, which has been built as Crossrail, were unveiled. The air-conditioned 160m trains, which have been designed and built at Derby, will start running between London Liverpool Street and Shenfield on the existing TfL Rail service as seven cars, because of limitations on platform lengths at Liverpool Street. A year later, the sets will be extended to 200m and be formed of nine cars when they start operating between Heathrow Airport and Paddington, with the full service then being extended under central London to Shenfield and Abbey Wood from 2019. Westbound trains will also then start running to Slough, Maidenhead and Reading. The Elizabeth line, which has been under construction as Crossrail since 2009, will add 10 per cent to rail capacity in central London, said TfL. Over the next few months challenging tests will be carried out on the first trains, including running them at Old Dalby test track with more than 100 tonnes of weights on board to represent a full load of passengers in the nine cars. Cars from the new trains will also be stressed in a climatic chamber. The £1.4 billion contract to build 600 cars for Transport for London has supported 760 jobs and created opportunities for 80 apprentices in the UK. Peter Doolin of Bombardier, who is the vice president responsible for projects, Crossrail and London Underground, explained: “The new Elizabeth line trains are based on our latest Aventra product family, a new technology for the UK." The Aventra series is essentially the next generation of Electrostars, which have been built at Derby since the late 1990s. Some of the last Electrostars are still under construction there in the form of Class 387s for Great Western Railway and c2c.